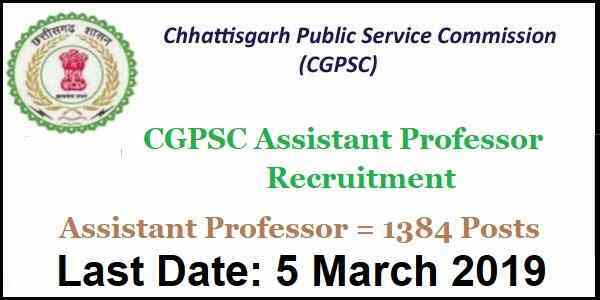 New Teaching jobs opportunity for Assistant Professor posts under Government of Chhattisgarh State. Public Service Commission department of Chhattisgarh government is looking to fill up the vacant positions of Assistant professor posts under various government collages and University. PSC Department is inviting online government job applications under teaching profession from all eligible candidates. There are total 1384 vacant posts which are going to be filled up through this PSC Recruitment process 2019. Those who are looking for the Govt jobs in Chhattisgarh under teaching profession can apply online for this Public Service Commission recruitment 2019. We acquired this job information from the official PDF file shared by the department on the public service commission official website of Chhattisgarh government. So all the rights related to the information which we shared in this article goes to the PSC official PDF file whose link we also shared under IMPORTANT LINK section at the last of this article. More information related to the eligibility criteria, application fee, online application is given below in this job posting. Read it carefully before applying these Govt jobs in Chhattisgarh. Pay Band: Rs.15,600 -Rs.39100 + GP Rs.6000 Per Month. Educational Conditions: Those who have scored At least 55% marks in the postgraduate degree level from a well-recognized university with a good academic record and Should qualified in UGC NET Entrance exam. Those who have completed their Ph.D. can also apply. Persons who falls in between this age boundary can apply online for these government jobs in Chhattisgarh 2019. Procedure for applying these Govt jobs in Chhattisgarh is online through the authorized website of the department of PSC. Online Job application form can be submitted through the Commission’s website whose link is : “http://www.psc.cg.gov.in”. The process for applying online is currently active and you can apply online up to 5th March 2019. After this Date the link will be deactivated for applying. Do not wait for the Last date to fill up the online application. Try to fill up online application as soon as possible because during the last day server remain very busy and cause some issues during the online registration.